Today’s Dietitian reminisces about the hottest trends that have influenced the nutrition profession over the past decade and a half and that will continue to do so in the future. Today’s Dietitian (TD) officially has turned 15 years old, and with this latest milestone, we feel a brisk walk down memory lane is in order. While looking back can bring fond memories of times past, it also can educate and inform us about what’s in store for the future. To that end, we’re highlighting some of the hottest topics and pivotal trends that have come to the forefront over the past decade and a half, not just to showcase what many RDs have experienced in their careers, but to illustrate how these topics and trends will influence the nutrition profession at large and the manner in which RDs will practice dietetics in the future. For example, the obesity and type 2 diabetes epidemics will present greater opportunities for dietitians to help improve patient care, as will foodservice in school districts across the country as RDs will be needed to ensure meals remain healthful and satisfying for students. It’s no secret that obesity is one of the biggest challenges facing Americans—and it’s certainly not a new dilemma. Nearly 36% of adults living in the United States today are classified as obese; that number for children stands somewhere around 18%, according to statistics from the Centers for Disease Control and Prevention (CDC). While obesity has become more prevalent over the past 30 years, Ruth Frechman, MA, RDN, CPT, a spokesperson for the Academy of Nutrition and Dietetics (the Academy), believes it was the CDC’s state-by-state obesity rate statistics that really put the issue in the public eye—where it’s been ever since. “It helped more people become aware of the skyrocketing problem of obesity,” she says. According to CDC data, in 2000, no state had an obesity prevalence greater than 30%. Fast-forward to 2010 and 12 states reported having that percentage. However, there have been glimmers of hope over the past several years, especially as it relates to childhood obesity. “One of the most well-known initiatives in the fight against childhood obesity is First Lady Michelle Obama’s Let’s Move! campaign, aimed at getting kids more physically active as a means of reducing childhood obesity,” says Constance Brown-Riggs, MSEd, RD, CDE, CDN, the author of The African American Guide to Living Well With Diabetes and Eating Soulfully and Healthfully With Diabetes. Whereas Let’s Move! addressed activity, new nutrition standards for school meals, released in 2012, aim to address what children eat day to day (more on that later). And in August 2013, RDs finally saw some good news hit the headlines: The CDC announced it was seeing, for the first time, marked decreases in childhood obesity at a national level. Such good news has yet to break regarding adult obesity, though two events in 2013 gave RDs hope for the future. The American Medical Association classified obesity as a disease, and Congress introduced the Treat and Reduce Obesity Act, which would allow RDs to provide and get reimbursed for intensive behavioral nutrition counseling with obese Medicare clients. From strategies to help children with weight issues get through the holidays to research on gut bacteria’s link to obesity, Today’s Dietitian continues to follow wherever this hottest nutrition topic may lead dietitians in the future. Due in part to obesity’s rise, the topic of diabetes continues to grow in popularity with each year. “[Rising] rates of overweight and obesity in adults and children have led to an increasing incidence of type 2 diabetes in both children and adults,” says Toby Smithson, RDN, LDN, CDE, a spokesperson for the Academy, the founder of DiabetesEveryDay.com, and the author of Diabetes Meal Planning and Nutrition for Dummies. “These statistics are particularly concerning when we already have a shortage of CDEs,” Brown-Riggs says. During this past decade and a half, TD has kept readers abreast of up-and-coming diabetes medications, whether it was reporting on the possibility of inhaled insulin in 2000 or highlighting canagliflozin, the first SGLT2 inhibitor approved by the FDA in 2013. Not only have medications improved, but advances in technologies are enabling patients to monitor more aspects of their disease while enjoying a higher quality of life. “New technology allows people with diabetes to engage in activities that would have been out of the realm of possibility years ago,” says Brown-Riggs, who gives race car driver Charlie Kimball as an example. In 2010, TD highlighted how Kimball uses a continuous glucose monitor to track his blood glucose levels while racing. “He’s a prime example of living well with diabetes thanks to new technology,” Brown-Riggs says. While diabetes management has seen many impressive advances, including mobile health technologies, Smithson says the tenets of overall diabetes management haven’t changed. “The three key points to managing diabetes remain, and they include consuming a healthful, balanced diet with a variety of foods, with a stronger emphasis on carbohydrate content; engaging in physical activity on a regular basis; and taking medications as prescribed by your physician,” she says. Although the past 15 years have seen many of today’s youths struggle with significant weight and related health concerns, many RDs are hoping the new federal lunch standards (seen by some dietitians as a long time coming) will help change the school nutrition environment for the better. In January 2012, the USDA released new nutrition standards for school meals, designed to combat childhood obesity as well as nutrition deficits and hunger. “These [standards] were the first update to the National School Lunch Program in 15 years,” Brown-Riggs says. These standards were seen as a much-welcomed change from 2000, when major beverage companies—and their popular-with-kids soda-pop varieties—started brokering “vending contracts” with school districts. While many RDs rejoiced over the new standards, some students rejected the new options that resulted, complaining they were still hungry at the end of the day. According to Deborah Beauvais, RDN, CDN, SNS, a spokesperson for the Academy and school nutrition director in Rochester, New York, students’ complaints may be misguided, noting that schools (and their student populations) need time to adjust but that the standards’ end goal is on point. “One must realize that the school meal program is the only area of foodservice that’s regulated,” she says. “Thus it’s being used to present good eating habits for life to school-aged children. It’s the living example of MyPlate. With federal nutrition standards recently updated, Beauvais says the next major hurdle for dietitians is nutrition education. “RDs can play a critical role, alongside teachers, coaches, family, and community members, in teaching kids why they should make healthful choices and encouraging them to try the bounty of produce available in their school cafeterias,” she says. Just what kind of education, and how much, should someone be required to attain before being able to provide nutrition counseling professionally? This is a hotly debated topic that has received much attention in the past few years. Unlike the federal nutrition standards, this issue largely has been handled at the state level. In 2013, TD covered the reauthorization of the Illinois law regulating the licensure of nutrition counseling professionals in that state. The original law contained a sunset provision that would have struck the law from the books in 2013 if it had not been reauthorized. Many non-RDs in the nutrition field felt the old law unfairly favored RDs. They successfully lobbied the state legislature, and the law’s reauthorization broadened the types of nutrition professionals who are eligible to be licensed, including non-RD nutritionists with certain nutrition degrees from accredited regional schools. When asked what this could mean for RDs practicing today, Angela I. Dougé, MPH, RD, LDN, assistant director of the didactic program in dietetic and nutrition science at Dominican University in River Forest, Illinois, expressed concern about this wider scope of practice, especially as it relates to the integrity of all nutrition professionals. “Being an RD, all professions have to be regulated to make sure we’re all competent. This is why we want to always hold to a high level of expertise to protect the public,” she said in the March 2013 issue of TD. The Academy took some heat for allegedly involving state governments to prevent non-RDs from practicing nutrition counseling, but according to Kay Mavko, MS, RD, LD, chair of the Academy’s Consumer Protection and Licensure Subcommittee, this is a common misconception that should be clarified for all RDs. The licensure the Academy is after, according to Mavko, is a minimum set of standards for safe practice, not specifically restrictive to an RD credential. “The requirements for licensure vary by state and are determined by applicants meeting specific education and training standards, not that the licensee must only be an RD,” she says. Dietetics licensure is nothing new, as it has existed in the United States for the past 20 years, Mavko says. But a growing consumer interest in all things nutrition (whether that includes diet information, nutrition news, and/or science-based or fad food products) has galvanized numerous people who want to jump into the counseling game, some with no expertise, to “get a piece of the action,” she explains. “In the case of state dietetics licensure, the premise isn’t based on preventing non-RDNs from seeking licensure but on establishing minimum qualifications to enter the profession and to ensure that licensees maintain standards that will protect consumers who count on safe nutrition services,” she adds. The trend toward producing genetically modified foods is another issue causing a rift among nutrition professionals. Genetically modified foods are those made from genetically modified organisms (GMOs), whose DNA are altered through genetic engineering to make them more insect resistant or nutrient dense, and it’s become a heated topic for many impassioned professionals who feel the research has yet to prove these foods are safe. Currently, this issue largely centers on labeling and whether consumers have a right to know that a food they’re purchasing contains GMOs. According to Sharon Palmer, RD, author of The Plant-Powered Diet and editor of the newsletter Environmental Nutrition, the issue came front and center for consumers in 2012 when the GMO labeling law was up for a vote in California. In early 2013, TD reported that the California law was defeated, but other states have followed suit. Connecticut became the first state to pass a bill requiring labels on genetically modified foods, though it doesn’t take effect until other neighboring northeastern states pass similar legislation. Washington State proposed a law to label genetically modified foods, but the law was defeated in early November 2013. At this juncture, Palmer says polls suggest that consumers mostly are in favor of labeling foods containing GMOs, though education on the issue is lacking. “Overall, there’s more concern and awareness of GMOs, but people don’t fully understand what this technology means to them,” she says. Someone need only look at the barrage of books published on green-health topics in the past decade to see how important these issues have become as of late. The literature on organics, sustainability, and other environmental issues has exploded, says Angie Tagtow, MS, RD, LD, owner of Environmental Nutrition Solutions, noting Bill McKibben; Marion Nestle, PhD, MPH; and Wendell Berry as just a few of the authors at the forefront of this trend. “Green eating and health have really emerged over the past 15 years,” says Palmer, who defines green health as an interest in the planet’s health beyond just human health. “I started writing about these issues about eight years ago, and they were just starting to come up on the nation’s radar. Now they’ve just exploded, and they continue to explode. Over the past few years, TD has reported on fair trade–food practices, organic farming, and sustainable seafood, to name just a few of the green-health topics that recently have surfaced. But while the conversation about green health is expanding, so is the concept itself. “Agriculture has taught me that sustainability is an emerging concept, and that it’s a process and not a prescription, meaning that we need to be adaptable to our conditions,” says Tagtow, who notes that the term “sustainable” unfortunately has been watered down so much that it’s lost its original intent. Moving forward, she welcomes RDs to join her in promoting sustainable and resilient food systems. As with GMOs, Palmer and Tagtow urge dietitians to be part of the green-health conversation. 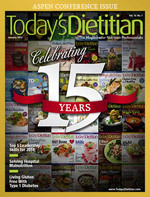 “Dietitians have the unique capacity to be at the forefront of this groundswell and lead education and practice in sustainable and resilient food systems,” says Tagtow, noting the Academy’s Hunger and Environmental Nutrition Dietetic Practice Group as a great resource for trusted and balanced information on these issues. Dietitians no doubt have noticed the progression in technology over the past 15 years. In fact, it’s been more of an explosion than a slow creep. “In the past 15 years, technology has advanced at such a rapid pace, and its use has become so pervasive that it’s almost impossible to compare life now with life then,” says Christin L. Seher, MS, RD, LD, an Ohio-based nutrition consultant and instructor who incorporates social media into many of her nutrition courses. But while social media technology may have started as a college trend, it found its way into adult personal circles, and the professional use of Facebook, Twitter, YouTube, Pinterest, and blogs now is commonplace, even ubiquitous—and dietetics is no exception. In 2012, TD reported on how RDs can harness the power of social networking technologies as a whole, as well as e-newsletters in particular, to market their brand professionally while promoting nutrition messaging. “What was once used as a platform for status updates, sharing photos, and keeping in touch with friends and family is now being used in a very different way: to market to consumers, to share news and information to build a brand, and to provide a source of data on topics of public interest,” Seher says. Because this information largely is user generated, accuracy definitely isn’t a given, which is why it’s so important RDs get out there and advocate for accurate and up-to-date nutrition messaging online where people are looking for the information. What does this trend mean for dietitians of today, whether seasoned professionals or newbie RDs? “The widespread use of social media technologies today means that dietitians need to be technologically savvy in ways that weren’t expected even just five years ago,” Seher says. To become tech proficient, Seher says first it’s imperative for RDs to know the difference between using these sites personally and professionally, “and always keep personal and professional accounts distinct from one another to help maintain professionalism,” she says. Research on the topic predominantly has revolved around oral immunotherapy or desensitization therapy, says Sherry Coleman Collins, MS, RDN, LD, a food allergy expert, though much still has yet to be uncovered about what causes these allergies and thus what can cure them. As such, protecting those affected remains a vital issue for RDs today. One great step toward this goal came in 2004 with the passing of the Food Allergen Labeling and Consumer Protection Act, which aimed to provide essential information to consumers with food allergies. “For the first time, manufacturers were required to list any of the ‘big eight’ allergens if they were intentionally included in their products,” Collins says. While the increased prevalence of celiac disease and demand for gluten-free foods has spurred a slew of gluten-free food products on grocery store shelves, consumer confusion about food allergies and celiac disease (which actually is an autoimmune disorder) persists. Probiotics is one of the biggest “bug”-words among nutrition professionals today, in part because of all the time the scientific community has devoted to researching the topic. “The past decade and a half has been ripe with research in probiotics,” says Collins, adding that research has shown probiotics are effective in reducing and treating various ailments—from antibiotic-induced diarrhea and Clostridium difficile to inflammatory bowel disease (IBD) and other digestive disorders. “Studies have shown benefit using E coli Nissle and a proprietary product called VSL#3 to treat ulcerative colitis, but not Crohn’s disease,” says Collins, who notes that more research is needed to determine if and what strains are best for treating IBD. In early 2011, TD reported on yet another avenue for probiotics’ potential: immune health. Partly due to all the science, and therefore media buzz, manufacturers have been introducing (and then marketing) probiotic products left and right. And though likely not dangerous for most consumers, there may not be much benefit to many of these products either. “If the probiotics are the effective strains, they may provide some benefit to consumers,” says Collins, cautioning that many of these benefits still are unproven. “We’ve learned that specific probiotics have specific action in the body; however, with so many different bacteria living on and inside the body, we have much more to learn,” she adds. For dietitians interested in recommending probiotics, Collins suggests following the latest research, recommending their use “with the caveats that evidence for their successful use is emerging.” This is sound advice that dietitians can apply to each nutrition trend that surfaces. Certainly, the dietetics profession has seen some exciting changes take place within the last 15 years. And while nutrition professionals may not know exactly what new trends may surface in the immediate and distant future, they do know that advances in technology and medicine and in nutrition science research will continue to help fight many chronic illnesses, such as type 2 diabetes, overweight and obesity, heart disease and stroke, and digestive disorders, and that they’ll be at the forefront of these incredible milestones. — Juliann Schaeffer is a freelance writer and editor based in Alburtis, Pennsylvania, and a frequent contributor to Today’s Dietitian. Editor’s Note: Parts of this article were changed to correct errors related to specifics of the Illinois law that regulates who can be licensed to provide nutrition counseling professionally in the state.